TNT gives each team (I'm Team Woodlands) an Honored Teammate - some one to get out of bed for at 5am to run 10 miles. Some of us come to the program with our own honored teammate, like my aunt. Some people who are doing this haven't been touched by a blood cancer, and that's when the appointed honored teammate is especially important. We have been appointed this little girl named Maya Cid. She is 2 years old. 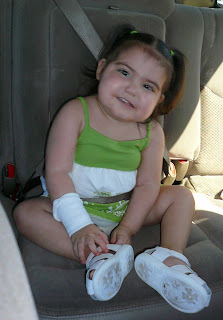 She was diagnosed with Acute Lymphocytic Leukemia (ALL) when she was only 23 months old. ALL is the most common childhood leukemia. Luckily, there is a good cure rate. Currently she's in the "consolidation" phase of her chemotherapy, which is the most intense. She is almost exactly one year older than Maddie. I can't imagine what she must be going through! This poor girl has probably only been walking for about a year, she's just learning to talk and play... and she has to go through chemo! It just makes me so sad to think about her. She's definitely going to be an inspiration to get me out of bed and keep going. Tara my love - I am so proud of you! You are such an incredible human being to begin with - this just puts you over the top. what a phenomenal thing you are doing, and what a beautiful little face to inspire you. If I cannot be there in person (I mean, who needs a good excuse to go to Dublin) I will at least be there in heart - cheering you on as you cross that line! hurrah!